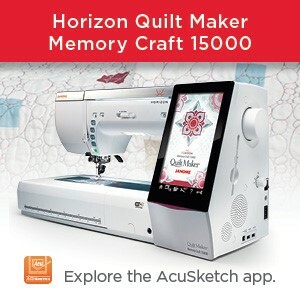 Do you own the Janome Horizon MC15000 Quilt Maker or previous version of the Janome Mc15000 upgraded to Quilt Maker? This post is for BOTH of the above answers….trust me and please read on! If you do not own a MC15000, please keep reading…..there is more for you below. If you own the Janome Mc15000 as outlined above and have updated your HORIZON LINK SUITE to the latest version (with that link that was emailed to you if you upgraded from a previous version of MC15000) or installed the HLS CD in your MC15000 Quilt Maker box onto your PC, then you indeed already have ACUSTITCH TOOL. Yes, well, maybe you did not explore? 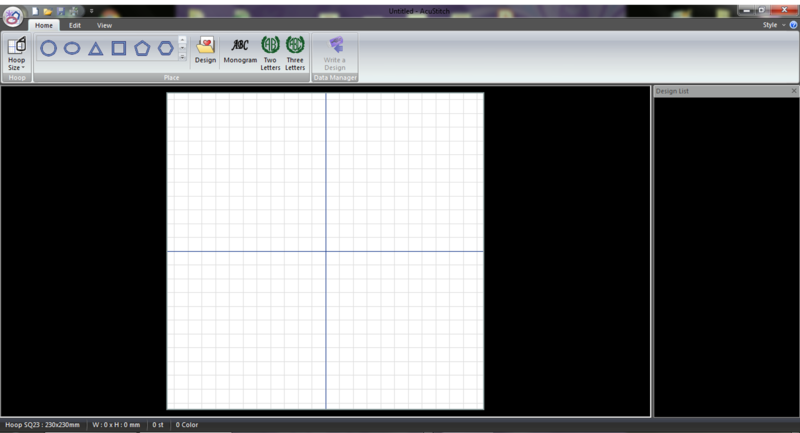 Open Horizon Link Suite and then Embroidery Link Tool. Cast your eye along the top tabs and find “Convert to STX” tab. Yes, I know, it does not say AcuStitch Tool but click on this and up opens AcuStitch Tool which was an update – and a FREE one at that!!!! Note the teeny, tiny little blue question mark ? in the top right corner of your screen. Click on that and VOILA! you have all the info you need to learn how to use this addition to the Horizon Link Suite of software for Janome MC15000. If you do not own a Janome MC15000, never fear……..I did say above that there is more for you if you do not own a Janome MC15000: I did not lie: We have a brand new software called ACUSTITCH – yes, because it is similar to the one for MC15000 above except that it is stand alone software which you can purchase and install onto your PC if you own the following Janome embroidery machines: MC15000; Mc14000; MC12000; Mc9900; MC500E; Mc450E; Mc400E; Skyline S9 or Atelier 9; MB7; NS-40; NS-4; NS-o; NS-1. I am not familiar with all of these models (as some may be models in countries outside of Canada) but if you have one of them, you will know and then you too can experience the joys of ACUSTITCH! The Part # is 202-419-008 and you may purchase this from your local Janome Dealer. As it is so brand spanking new, they may need to order if for you. It is very inexpensive – way less than you would expect so treat yourself to some fun: create circles, lines, hexagons, octagons, triangles : sewing machine stitches to embroider in your hoop – perfect every time! Resize, re-arrange and change colours of stitches. I have included the official bulletin about this new product below and after that some screen shots of the software process – to show the cool things you can do with this software. 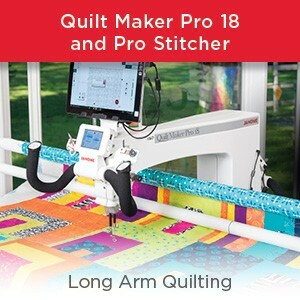 Janome girl did a great post last month on this new AcuStitch tool software with Project of the month how-to instructions. Check it out if you missed it. 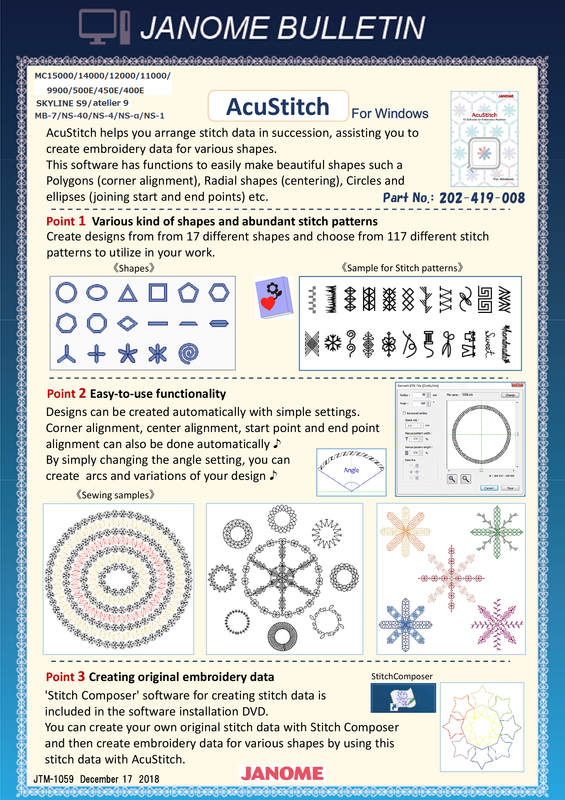 We will be offering more posts in the coming weeks and months with inspiration and more for this new ACUSTITCH SOFTWARE. 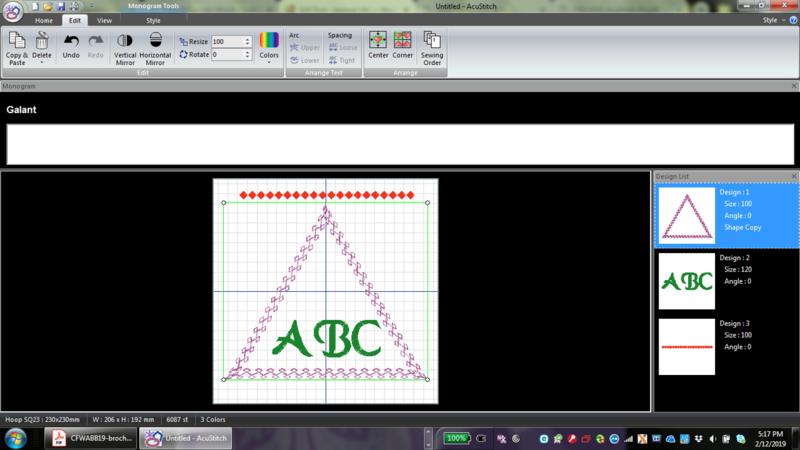 Pick a shape, pick a machine stitch from the built-in list in the software, make changes to the selected stitches in Advanced settings; add lettering (ABC in this example); add a border from Border or Normal Sew; change colours, etc – many of the same features we have been enjoying in Embroidery Link Tool/Horizon Link Suite. See pic below for some creative fun……and we have not even started to embroider this yet! Write the design to your USB stick or send wirelessley to the MC15000 or Skyline 9. 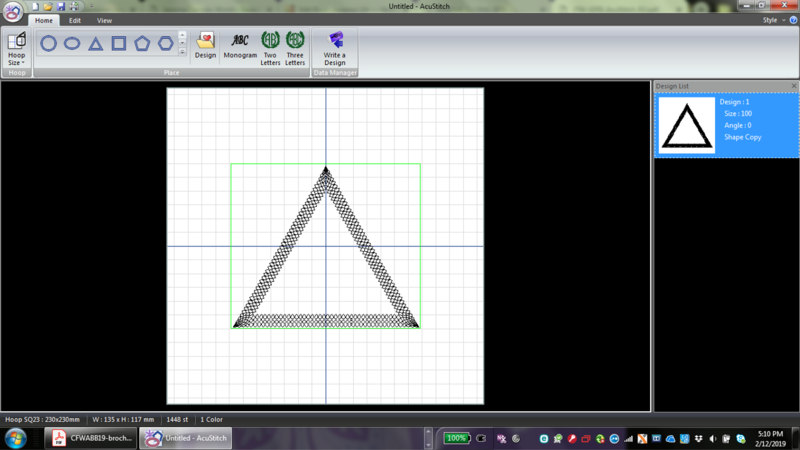 Please note, I have only just scratched the surface of what is possible…..there is much more: how about this shape???? Please note that this is a Windows based software. It is not an App for your iPad nor is it a software which can be used on a mac without having parallels or similar on the Mac. Getting excited???? We are and more will come in future posts so stayed tuned! Visit your local Janome Dealer for more information and to order your copy of this software. 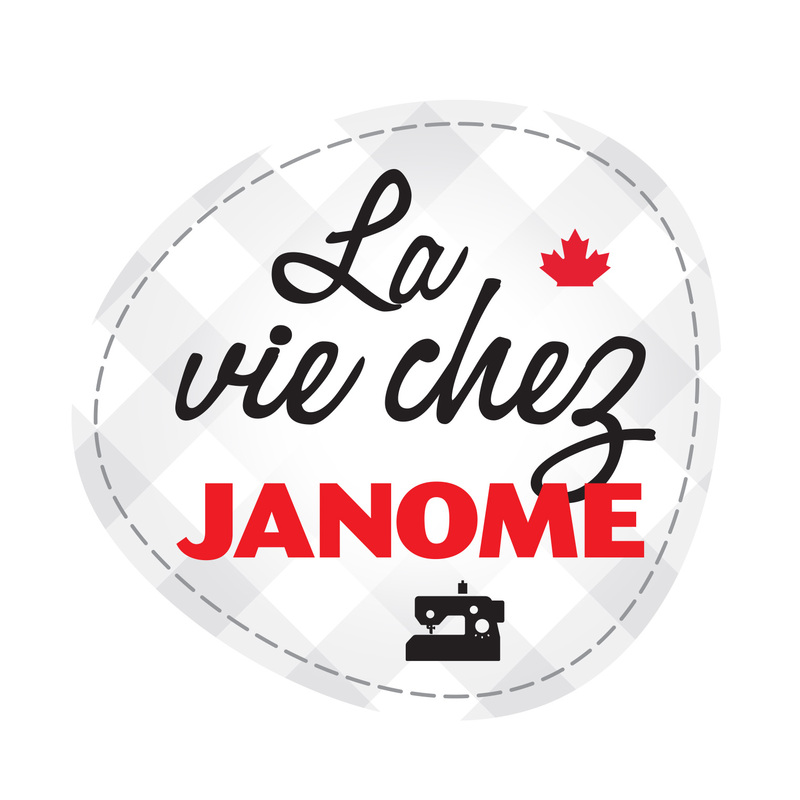 This entry was posted in Janome Sewing Machine and tagged Janome AcuStitch software, Jnaome AcuStitch Tool in Horizon Link Suite for MC15000, NEW Janome software to play with and stitch sewing machine stitches in your hoop. Bookmark the permalink. 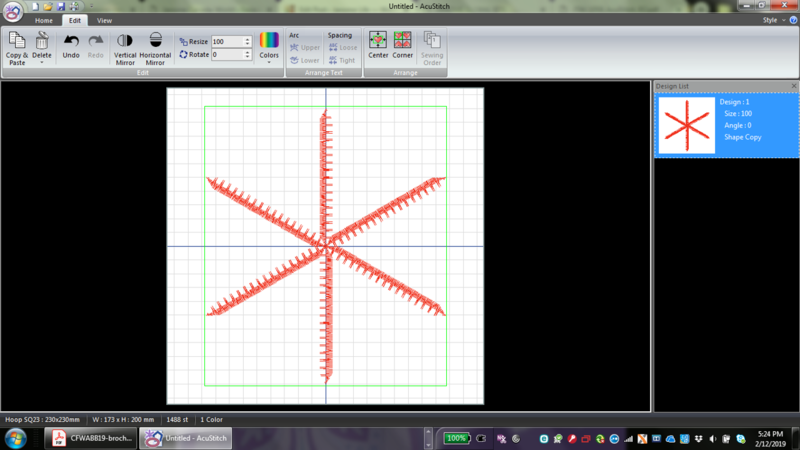 9 Responses to GLAD YOU ASKED THAT: What is AcuStitch Tool and what is the NEW AcuStitch software? How much is the new acu stitch software part 202-419-008? We do not quote pricing on this blog at all. Please enquire at your local Janome dealer for pricing information. Thanks anyway. I am in the Uk and get very frustrated when we can’t get things here! Am visiting the US IN May and shall ask my friend to make some enquiries. All the more reason why we do not quote pricing! We would have no idea of the pricing in the UK or the USA. We are in Canada. Sorry. This software comes from Janome in Japan so should be available globally. Why don’t you contact Janome UK in England and ask them? Thank you for the great information. 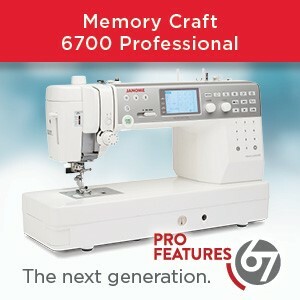 The MC11000 was listed as a machine that the Acustitch program could be used with. From within the program, MC11000 is NOT listed as a compatible machine. Good point. I will have to investigate. I have not seen the box of the new software. I did use the official bulletin put out by Jnaome and MC11000 is listed as compatible. I will ask our Tech Support people but you could also do that: 1-800-631-0183 Ext 775 or tech_support@jnaome-america.com. I have part of the answer to your query: you need to go to the little blue question mark in the top right corner of the software screen once you have opened AcuStitch. You will select your machine from the list there and it will then show the applicable hoops etc for your machine. However, you are correct that MC11000 is not listed there while it is on the bulletin. I am awaiting further information about this. Yes, your machine is a deluxe top of the line sewing and quilting machine but it is not an embroidery machine. This software is for hoop embroidery machines. However, your MC9400 does have wonderful Stitch Composer Software for creating and then stitching out more sewing machine stitches should you wish to do that. Please search for Stitch Composer in the search box on Janomelife and you will find much information previously posted about what you can do with this software. Maybe you have had creative fun with it already? If not, you might like to try?